I’ve doodled about with shisha embroidery before. I love it, especially the stitches involved and the decorative possibilities with those stitches. So I got it into my head that I’d like to do a few Stitch Fun articles on different approaches with shisha embroidery, or mirror work. That idea led me to playing about with all kinds of stuff. And now I’ve got a mess on my work table again. And the aforementioned tutorials are not ready yet. Isn’t that always the way of it? For those who don’t know what shisha embroidery is, it’s a kind of embroidery originating in India, involving the fixing of little mirrored tiles (usually glass, but there are all kinds of approaches and interpretations to it these days) onto the fabric surface using decorative stitchery. Back in the 1970’s, an episode of Erica Wilson’s needlework show on PBS highlighted shisha embroidery, and the episode is available on YouTube, if you want to watch it and become a little more familiar with the technique. It’s fun to watch! I like to play around with shisha embroidery, straying away from mirrors in particular to fixing other things (even decorative paper, pictured above) to the fabric surface. Recently, I ventured into playing with acrylic mirror shapes produced by Simple Shisha. 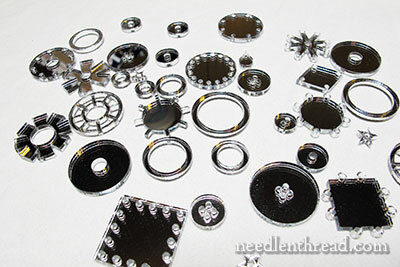 I thought I’d show these to you, in case you’re looking for a fun way to add some serious sparkle and reflection to your embroidered crafts. 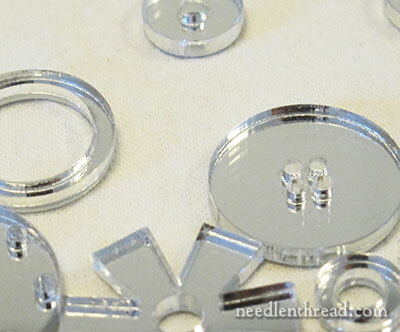 They’re a lot of fun, and they open up all kinds of possibilities not just for embroidery, but for other crafts, too. What the folks at Simple Shisha do is back clear acrylic with a reflective coating and cut it into all kinds of fun shapes that can be fixed to fabric in different ways. Unlike the more traditional mirrors (or mica chips), many of the acrylic shapes have holes along the outer edges so that embroidering the shapes to the fabric is fairly easy. But they also have other shapes that don’t have holes along the outside edge. They have holes in the middle – like donut shapes, rings, snowflakes, gear-like shapes, hearts, diamonds, stars, teardrops, etc. The tiles really are reflective, just regular mirrors! There are a few definite differences between the acrylic mirrors and regular class mirrors. On the positive side, acrylic is a lot lighter than glass. So you can pack on a lot of “mirrors” without the weight associated with glass mirrors. Acrylic is also more versatile. With acrylic, intricate shapes can be cut. Glass would chip and break more easily with some of these shapes. When embroidering real shisha mirrors, it’s helpful to sand the edges of the mirrors with a stone (a fine, smooth pumice stone or a honing stone works well for this) to eliminate sharp edges. With the acrylic mirrors, this isn’t as necessary. On the negative side, though acrylic is pretty tough stuff, it is prone to scratching, much more so than glass is. It’s easier to scratch acrylic with the sharp point of a needle than it is to scratch glass. 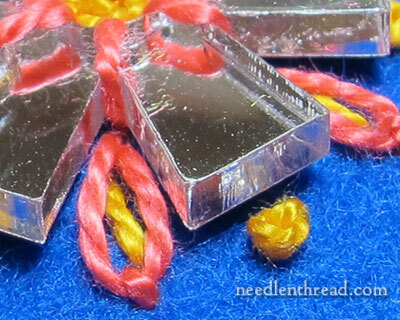 Using a blunt tapestry needle is helpful. Zooming in on this edge can be a little deceptive. size-wise, but another notable difference is that the acrylic mirrors are slightly thicker than regular shisha mirrors. This makes traditional shisha embroidery over the round or square mirrors a little more difficult. If you’re thinking of embroidering a masterpiece that you want to last through generations, acrylic might not be the way to go. 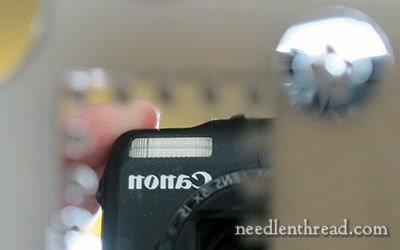 But if your focus is more along the lines of fun crafts, the acrylic mirrors can open up so many possibilities. If you’re interested in trying them, I got mine from Simple Shisha, where they have a great selection of all kinds of neat shapes. June 23, 2017 Shisha & Variations: How to Add the Magic of Mirrors (& More) to Your Needlework! I recently had an adventure with Shisha. For a quilt guild challenge, I made an art quilt called “Pennies from Heaven”. It began with just US pennies, but quickly evolved into many dominations of coins from all over the world. There’s an Edward VII sixpence, a 1902 Indian head, and coins from 6 continents and over 40 countries. They were all shished onto hexagons, and the whole piece was embellished with embroidery and beads. Shisha and I became pretty good friends and I love the stitch. Wow Nancy, I would love to see that. My embroidery roots are in bead embroidery (which then got me interested in traditional embroidery) so this sort of stuff is right up my alley. Thanks for sharing this Mary! I’m all excited about these. I haven’t run across them before. I’ve found some weird shapes to use in vintage glass before, similar to this. But boy does a piece get heavy when you are using glass pieces. You have to worry about interfacing it heavily and sometimes that ruins the whole idea. Wow, love this post! Thank you for this information. Shisha is one of my pasttimes and I did not know about all of this! Very good info and pics! I love watching Erika Wilson videos. She’s such a hoot. That’s were I learned Shisha and I think it was you who told me where to find her, Mary, in a blog post a while back. Another alternative material is shell. I found someone selling bags of mother of purl circles in various sizes. They looked like they may have been rejects from a button factory, some of them. Most were quite nice, though, and looked really nice on a kaki background with cream thread shisha. I suppose you could use buttons and cut off the shank. Like your post suggests, keep your eyes open for things to try. I bought some Shisha mirrors and watched the Erica Wilson on you tube after your previous post but unfortunately I haven’t had time to try them yet. The acrylic from simple shisha look really interesting all the different shapes and sizes you could do a lot with those. I really like your first photo, I like the idea of trying other objects apart from mirrors. Thanks for sharing this with us. I work in the plastics industry so wanted to share some more information about the acrylic “mirrors”. I suspect the supplier uses extruded acrylic rather than cast acrylic. Extruded acrylic has a more even thickness but if it comes into contact with perfume and some cosmetics it can craze (it looks like it’s shattered). Stitchers may want to bear that in mind if they’re thinking of using them for clothing, or embroidered jewellery or something that may come into contact with perfume. It will also craze if too much heat is applied to it. This won’t happen in the summer, but if it’s near a hot appliance it could happen. Acrylic sheet starts at a thickness of 1.5mm and goes up to about 20mm. You could perhaps ask your supplier to use a thinner acrylic if you find the acrylic they use too thick. I’m guessing they use a laser to cut out the shapes as the edges are so neat, you can laser 1.5mm acrylic so it shouldn’t be a problem for them. I just had a look and they say their acrylic is 1/8″ which is roughly 0.3mm so they could go thinner. Wow, that was boring wasn’t it! Hi Mary, Thanks for showcasing this supplier and what you’ve done with the flower shaped piece. I see those ring shaped pieces in my future! Also, I’ve used 20 and 30MM paillettes as “mirrors” in shisha work. They come in many metallic colors as well as silver. The small sewing hole is no issue; it is easily covered by the embroidery. They can be washed, but no direct heat as they will warp. 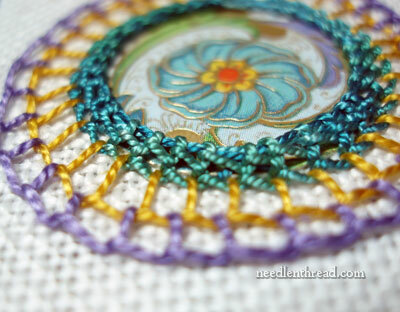 I was looking at this stitch just a couple of days ago and here it is in full color! 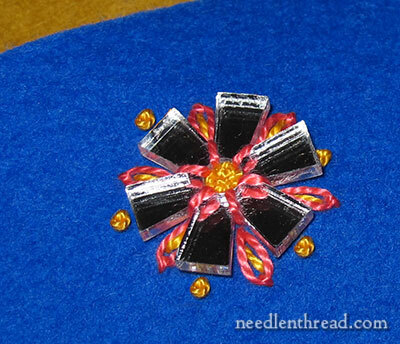 The wheels are turning for using this on an embroidery project that I am starting in the next week or 2. I am new to hand embroidery and I am really having fun with it. I really like the videos on your site-I watch them over and over when I am learning a new stitch. I was talking to a lady the other day about how the sisha mirror techniques can all be used to attach beetlewings. Agree? Jessica Grimm/Nederlands RSN has worked with sishha techniques with beetlewings – there’s a lovely pic in her Facebook page header. I was always wondering what Shisha embroidery was. And there it is. Glad to have found this blog. Well ain’t she a beauty? I love it.